Even when my plate is full, side projects keep me happy. Side project 1 - Today I got the SFG Blankbook! It's my turn now. I've been flipping through the whole book and the artists that have illustrated spreads so far are amazingly talented. I think I was a bit (more like - very!) delusional when I signed up for this. Where did I come up with the idea that I could measure up to the likes of all the illustrators here? Too late. I've got to come through with something. Side project 2 - Remember I mentioned fabric designing a few days ago? It seems like things are lining up for me to give it a try. First off, I learned about Spoonflower a few weeks ago. I signed up and got my invitation yesterday. At Spoonflower, you can upload your own patterns and a few days later you get your custom designed fabric in the mail. Then, today, Jessica blogged about her start with fabric designing and she provided a wonderful link to tiling in Illustrator which I really needed. Thanks for sharing Jessica and thank you for sharing my to do list with your readers. So here are the two swatches (8" x 8") of fabric that I ordered. No, these aren't part of my tiny stash of patterns. I decided that before I invest any serious money on fabric (for things like cushions - nothing too adventurous) I want to verify the quality of the printing that Spoonflower offers. One swatch is to see a sampling of some colors and how they may or may not change from file to printing. The second swatch is to verify coverage on a larger area and the crispness of lines. I guess I should've included some thinner lines here too. Too late. When I get my swatches I'll let you know what the results are. Side project 3 - I put a mood board together for Holly's mood board contest. I've never done anything like this so it was a fun exercise. Here's what I put together. Tiny side project 4 - I gave my freebies page a small face lift. It was looking really sad. I can't wait to see how those swatches turn out..although I do like printing by hand. Spoonflower is all the buzz in the crafty world right now - I just got my invitation today and can't wait to try it too. 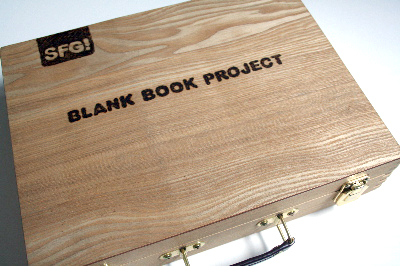 The SFG blank book is in a super great case. You'll have fun with whatever you do I'm certain! waiting to see your fabrics specially the one with leaves..
You should go ahead with your fabric designing idea. Waiting to see some steps taken in that direction. Oh, oh, oh...the ORANGE FABRIC! I am in love. And I love love love Jessica at howaboutorange. I keep using her fabric for bags!! Oh really? I'm glad you all like the leaves. That makes me take a second look at it. I was actually considering not using it for a pattern. It's something that I had from a long time ago. Pintoo - As far as the mood board... I'm no expert for sure (it was the first time I made one ever). What I did was take images from the different sites where I found things I liked. I provided links to all the items in my flickr photo page. I think it's pretty standard that it's ok to use whatever you need as long as you give credit to the site where you got the image from. Hope that helps! Loving all of the projects you are working on. The SFG blankbook sounds really, really neat. I would love to take part in project like that. Maybe next time. It's funny because when you did mention fabric design prior I immediately thought of Jessica at HAO. I'm sure you will turn out something really lovely. I'm thinking of taking a leap and entering, time permitting, the mood board design. I did read about it over at Decor8. If anything it's good to get creative and give it a go. Yours is so clean and modern. I'm a fan browns and earthy colours.